Mary S. Coleman was born on June 24, 1914, in Forney, Texas. Both of Coleman’s parents were attorneys. The family moved to Washington, D.C. when she was still young. 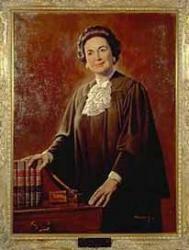 Upon her father’s early death, Coleman’s mother took the position as chief of the section in the U.S. Department of Justice responsible for enforcement of the beer and wine provisions of the Volstead Act. Although Coleman and her mother were subjected to various threats due to her mother’s position, they enjoyed other experiences such as meeting Franklin D. Roosevelt and Herbert Hoover. Coleman enjoyed her college experience and was twice voted “Miss University of Maryland.” Following her graduation, Coleman attended law school at George Washington University during the evening, in addition to working a full-time job. She met her husband, Creighton Coleman, while in law school and the couple married following their graduation. Coleman and her children joined Creighton in Germany when he was stationed there following World War II. When she and her daughters left Germany, they were flown out during the Berlin airlift.